Who does not know Park, which is very popular with the tourist submarine (diving) it. 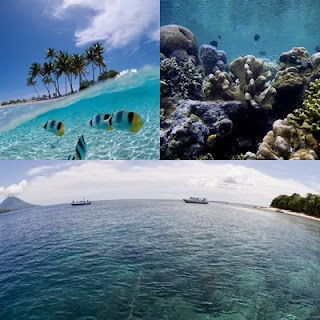 Bunaken is an area of ​​8.08 km ² island in the Bay of Manado, located in the northern island of Sulawesi, Indonesia. 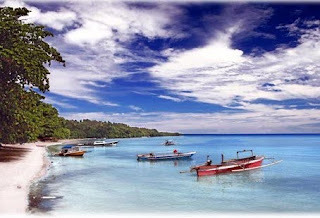 This island is part of the city of Manado, the provincial capital of North Sulawesi, Indonesia. Bunaken Island can be achieved by speed boat (speed boat) or a rented boat with about 30 minutes journey from the port city of Manado. Around the island there Bunaken Bunaken marine park which is part of the Bunaken National Park. This marine park has a marine biodiversity one of the highest in the world. Scuba diving attracts many visitors to the island. 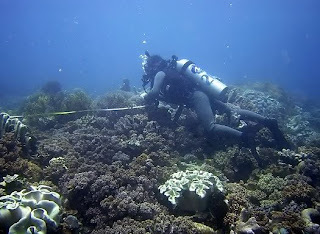 Overall Bunaken marine park covers an area of ​​75,265 hectares with five islands within it, namely the island of Manado Tua, Bunaken Island, Island Siladen, Mantehage Island follows several children his island, and island Naen. Although covering an area of ​​75,265 hectares, the location of the dive (diving) is limited in each of the five beaches that surround the island. Bunaken National Park is very representative of Indonesian tropical water ecosystems consisting of mangrove ecosystems, seagrass beds, coral reefs, and land / coastal ecosystems. In the northern part consists of the island of Bunaken, Manado Tua island, the island Montehage, Siladen island, the island Nain, Nain Small island, and some coastal areas of Cape Pisok. While in the Southern Cape coast includes some of Palm . How to reach the location: Bunaken National Park can be reached via the port of Manado, Marina Nusantara Diving Centre (NDC) in the District of Molas and Marina Blue Banter. From Manado harbor by boat to the island Siladen motor can be reached + 20 minutes + 30 minutes of Bunaken Island, the island Montehage + 50 minutes and +60 minutes Nain island. From Blue Banter Marina with a yacht that is available to the tourist area on the island of Bunaken are within 10-15 minutes, while from the port of NDC to the dive sites at Bunaken island by speed boat to within + 20 minutes.